Funny how the mind works, isn’t it? I saw this floral plate and thought about a bear stamp! Now granted, this sweet little guy is holding flowers! The image has been stamped in Memento Tuxedo Black and colored in Copics: BG10, E25 ,E51, E53, E55,G07, R0, R27, RV34, RV63, YG05, YG07, YR00, YR04, YR07, and YR24. Then sponged in the die with SU Peach Parfait. A little bit of Diamond Stickles was added to the center of each flower for a some bling. This die is a Label 18 from Spellbinders. The layer beneath the main panel is a Spellbinders Fleur de Lis Motifs and beneath that is just a plain rectangle. The cardbase is SU Peach Parfait and the designer papers are also from SU – the Designer Series Paper Patterns Pack – In Color. The sentiment is simply stamped on the striped panel. The stamps are from Fizzy Moon and called With Love. Hoping your day is sunny and bright! 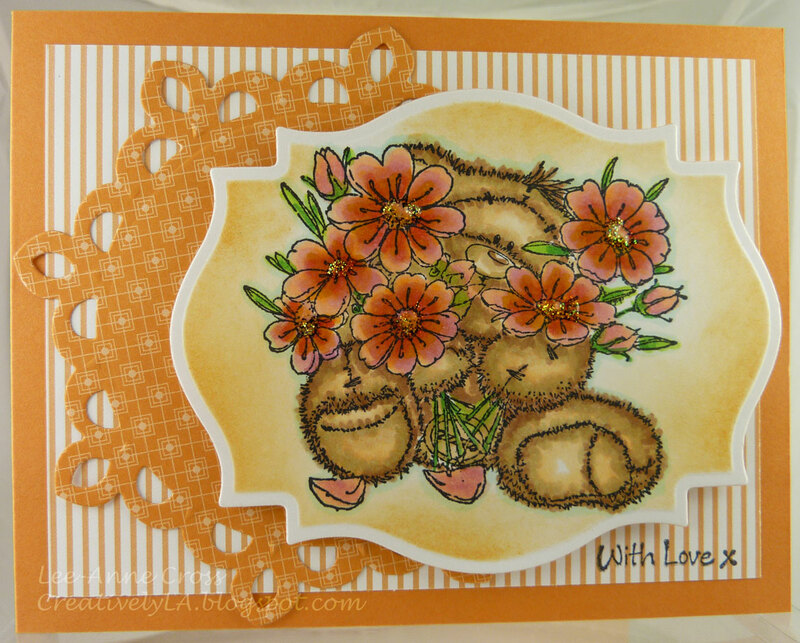 Gorgeous Lee-Anne…you've colored it beautifully and the sponging is fabulous. Super delightful!